Sea lamprey trapping can be improved significantly when electricity is used, according to a recent study funded by the Great Lakes Fishery Commission (GLFC). The study, led by scientists from the U.S. Geological Survey (USGS), U.S. Fish and Wildlife Service, and Fisheries and Oceans Canada, demonstrated a 75% sea lamprey capture rate when electricity was used to “guide” lampreys to traps, compared to an average rate of 50% without electricity. The experimental system developed by the research team involved a portable trap paired with a low voltage, pulsed direct current generated by vertically-oriented electrodes in the water column. The electrodes created an electrical fish barrier across the stream channel that was run at an angle to guide migrating fish into a trap at the far end. The research team deployed the system in 2014 and 2015, during the time when adult sea lampreys are moving upstream to spawn. During the first year of the project, the electrical guidance system was only activated every other night (sea lamprey are nocturnal species) to demonstrate that significantly more sea lampreys were captured in the trap when the system was on than when it was not. team captured 60% of sea lampreys in the stream the first year and 75% of in the second year. The new study builds on sea lamprey knowledge that dates back to the 1950’s. With additional research and development, control program experts hope this technique could be used to enhance sea lamprey control. Sea lampreys are parasitic, jawless vertebrates that feed on the blood and body fluids of other fishes. The species invaded the Great Lakes in the 1800s and early 1900s and have caused enormous ecological and economic damage. 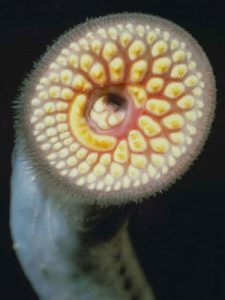 The Great Lakes Fishery Commission’s integrated sea lamprey control program combines lampricides, barriers, and traps. The control program is remarkably successful: sea lamprey populations in most areas of the Great Lakes have been reduced by 90% of their historical highs, which saves an estimated 100 million pounds of Great Lakes fish per year. Sea lamprey trapping is an integral component of the successful sea lamprey control program, and this study suggests the control technique, with relatively simple changes, can be enhanced significantly. Sea lamprey control is essential to the $7 billion Great Lakes fishery.